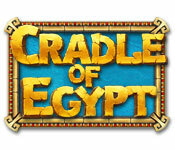 Cradle of Egypt is rated 4.4 out of 5 by 89. Rated 5 out of 5 by gamefan10 from The best game in the series I have had this game for several years and have played it many times. It's a Match 3 game, but has many other resources and types of play also, which keeps it interesting. 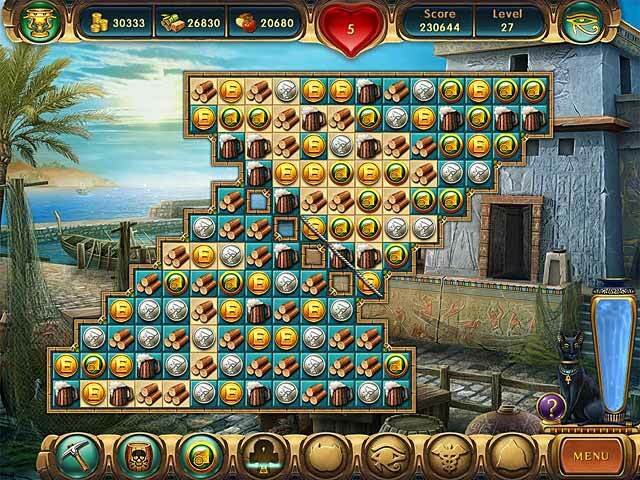 There are 100 levels to the game, and difficulty increases as you get to the higher levels. All of the extras, from barriers put into the playing area, artistic designs, interesting but skip-able mini-games, helpful resources you can earn by completing tasks, exploding pieces that help clear the area, higher levels you can earn, and a nasty little creature that drops down and interferes with your game - all of these help to make the game more fun and challenging. The reason I like this game more than the others in the series is that you can turn off the timing option and just relax and play for fun. This game is very well done and enjoyable to play. I highly recommend it for those of you who enjoy Match 3 games, and even for those who would like to try one. I think you'll like it! Rated 5 out of 5 by scruffyHOG from The Best Match 3 Game Ever! I played this game years ago when it first came out, and loved it. Very addictive, and was so sorry when I could not play it any more with computer system upgrades. No Match 3 game has lived put to this. Now it's back! Don't be fooled by how easy it seems at the beginning - it gets more and more challenging, to the point of being impossible - almost. What I enjoy about this game is that you don't have to use the bonus tools to win a round (some Match 3 Games you can't win without them), but they sure do help as the difficulty progresses. After you win your first trophy, make sure you check out the trophy room - you'll find some very difficult trophies to win (like never using a bonus tool, or conversely, using a bonus tool up 10 times within a game). The story is silly, but that doesn't matter to me - that's not what this game is about. Hope you enjoy! I'll be playing this again, over and over. Rated 5 out of 5 by ChristinaX9 from Best Game of its Kind I absolutely adore this game. It is probably the best match three game I have ever played. 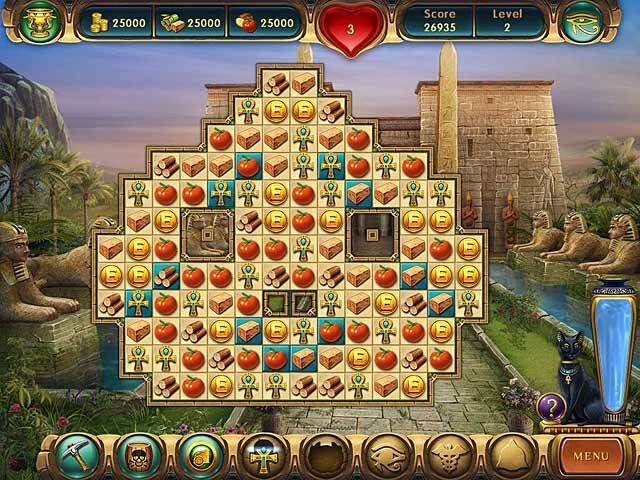 You need to make matches of three or more symbols in order to earn resources and begin to build Egypt and its great monuments. There are 100 levels and the further you go the harder it gets. The timer also makes things much more interesting, but you can opt to go without it if you do not relish a challenge. Love this game, everything about it, even the music is great, atmospheric and amazing. Top marks to the producers, please make more match 3 games like this one. Best in the cradle series too. I cannot recommend it enough. Get it now. Rated 5 out of 5 by pennmom36 from Cradle of Egypt The long awaited sequel to the Cradle of Rome series and my personal favorite although I think the original Cradle of Rome is the most difficult. This is a Match 3 game where you match 3 or more resources and with the money and resources you earn, you buy plans for a building. The plan is actually a mini game such as rotating discs to complete a picture and when finished you buy the actual building and with that building you receive a bonus or new resource. You get a new life for every 100,000 points. There are bonuses to help you such as a pick to destroy 1 tile, a powder keg to destroy 9 tiles, a chariot to destroy an entire row, an ankh to stop time, a winged sun to destroy 25 tiles, the eye of Ra to destroy 15 random tiles, a liquidizer to scramble all tiles and a star to clear all alike tiles of your choice. There are obstacles to overcome such as marbled and double marbled tiles, roped and double roped tiles, stone tiles and those dreaded skulls are back and in abundance. This game offers Torney mode which is unlocked at 200,000 points which is a race against the clock trying to beat the devs scores. You choose a single bonus and you can earn a bronze, silver or gold cup. My favorite feature is the Blitz mode which can be played in Easy, Normal and Hard modes for bronze, silver and gold cups. You start at level one and play continuously until the timer runs out. To keep the timer full you need to make matches as quickly as possible if you hesitate the timer starts to drain, bonuses refill the timer as well but need to be collected before using them again. This game has 16 citizens and 12 trophies to earn in adventure mode. A new feature is a magic chest you get when you match the same resource 4 times in a row. They have added more arrows to this game as well. You get an arrow when you match 5 tiles which destroys 5 tiles, a super arrow for matching 6 tiles which destroys 9 tiles and a mega arrow for matching 7 tiles which destroys 25 tiles! There is no better Match 3 game out there I promise you this, enjoy! Rated 5 out of 5 by AntDoot from Cradle of the Best As many others have commented, this is by far the best of the Cradle 0f... series. My only concern: when will the iPad version be ready? Rated 5 out of 5 by AdrianaIP from That's how a build game should be The Match 3 is fun, with nice tiles, nice challenges, and good power ups (and which powr up depneds on the tiles - sometimes if you get stuck with a level, it pays to restart and hope for tiles with a more useful power up attached.. And the powerup gets recharged with your matches, so it pays to stay in a cleared area to recharge it). What you build up is Ancient Egypt which is beautiful enough, It is a great way to spend your time. Rated 5 out of 5 by rames111 from Best of the Match 3 Games I've Played So Far This game is fun from the start and gets increasingly more difficult until you learn the tricks of the patterns presented. I completed all the levels twice and will start on the 3rd try soon. You'll love it. Explore the lands of the Pharaohs and the Cradle of Egypt! 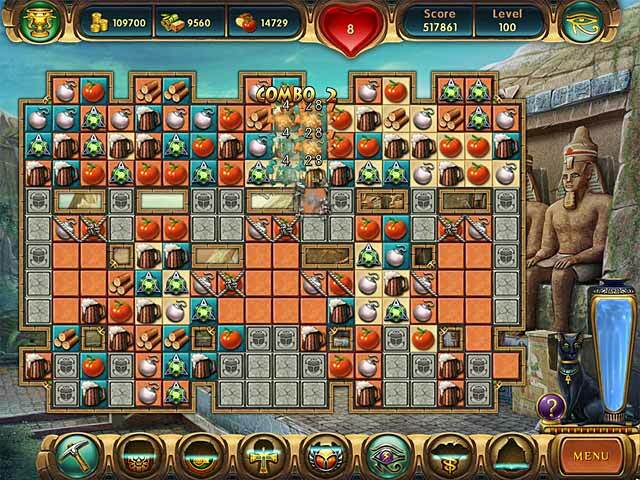 Enjoy the miraculous constructions in this awesome Match 3 game!